"You know, I think I'll feel much better if I make a healthy meal tonight. I'm sure I could throw something together really quickly if I wanted to." "But I already have all the stuff I need. It really won't take that long." "I even have that orange 'chicken' I can use." "Orange 'chicken', you say? Well, maybe just this once." I'm actually not sure how I prevailed in that conversation, but moving on! 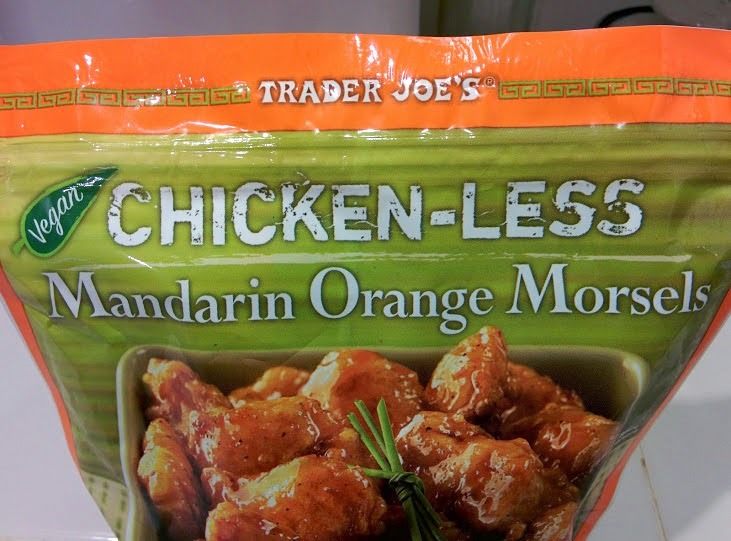 A few weeks ago, one of my very good friends recommended that I try a Trader Joe's brand of "Chicken-Less Mandarin Orange Morsels," which I did, and it's now pretty much my favorite thing ever. It had never even entered my mind that there might be a vegetarian version of that, so I'm so glad she mentioned it (thanks, Janet!). 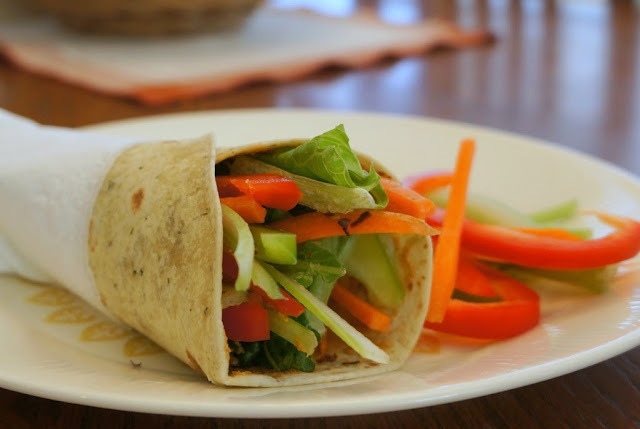 It's fantastic, and there are lots of things I can do with it in a pinch when I'm tired and don't want to spend a long time cooking anything. 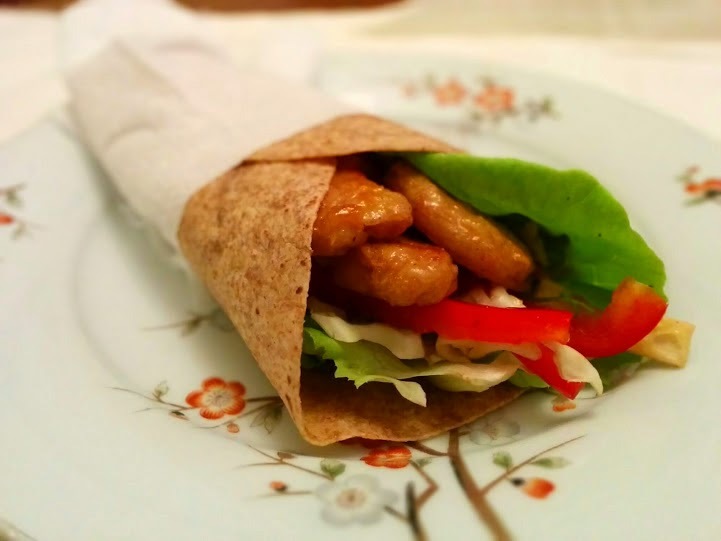 I've done orange "chicken" over rice with stir-fried veggies, I've done salads, and now this wrap, which turned out super good. Cook "chicken" according to package directions. However, you can use any kind you can find if you don't have a Trader Joe's nearby! 9.25 oz bag of Trader Joe's "Chicken-Less Mandarin Orange Morsels"
1 bag of pre-made Asian Chopped Salad. I used this one, which has cabbage, carrots, celery, green onions, cilantro, wonton noodles, and sliced toasted almonds. I saved the dressing that was included for another time, since there was plenty of salad left over. 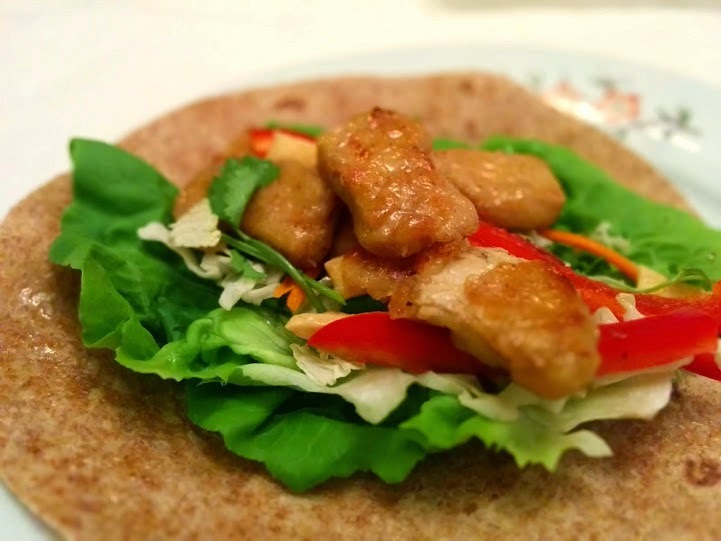 1 package medium whole wheat tortillas. I really like Guerrero brand because they taste good and don't get gummy like some do.